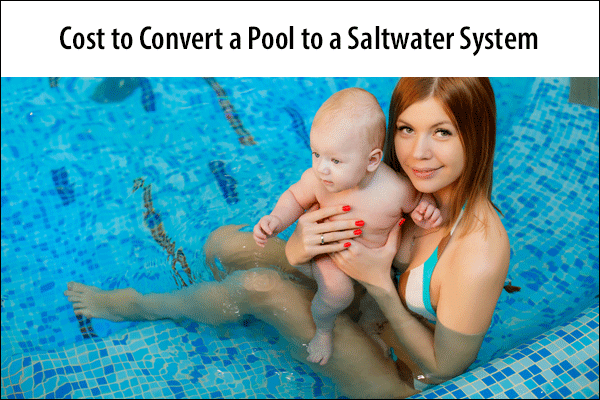 KompareIt > Home & Garden > Pools > Can I Convert My Pool to a Saltwater System? Generally, it will cost between $1,200 and $1,500 to purchase and install a chlorine generator. 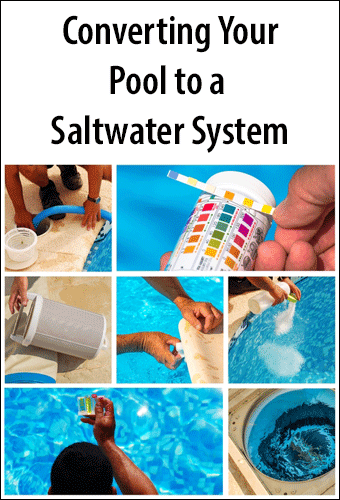 The salt for the chlorine generator only costs around $20 to $30 per year. Salt is corrosive, so most chlorine generators need to be replaced every 5 years. Saltwater pools are growing in popularity because they require fewer harsh chemicals and less maintenance than traditional pools. Converting to a saltwater pool means no more chlorine to buy or add, no more skin irritation and the end of green hair. One of the biggest misconceptions about saltwater pools is that they do not contain any chlorine at all. In reality, chlorine is necessary for pool sanitation. However, the chlorine levels are much lower, and the chlorine does not have to be added manually. Another misconception is that they are overwhelmingly salty. The salt level is similar to that of natural tears, which is about 10 times less salty than the ocean. Converting a traditional pool to a saltwater pool requires buying and installing a chlorine generator that converts salt to chlorine - that’s it. How Much Does It Cost to Convert My Pool to Saltwater? Most chlorine generators cost $700-$1,000. With installation, the total cost usually ranges from $1,200-$1,500. However, keep in mind that prices vary depending on the type of chlorine generator, the size of your pool and your location. Most chlorine generators last three to seven years, but they can last longer if well-maintained. Salt for the chlorine generator runs just $20 to $30 or so per year, saving hundreds of dollars annually over chlorine. For an average swimming season of four to six months, most people spend $250-$300 on chlorine tablets. Converting to a saltwater pool may or may not save money in the long run. If you pay $1,200 for a chlorine generator and installation, and the generator lasts five years, it will likely pay for itself in saved chemical costs. If it lasts less than five years, that’s not the case. Because its a gamble, the best reason to convert is to make your swimming experience more comfortable. Saltwater pools are softer on the skin. They’re less likely to cause itching, burning or dry skin. They won’t turn blonde hair green or fade swimming suits. You can open your eyes underwater without irritation. Saltwater pools are also self-regulating. The produce a steady flow of chlorine at all times, whereas chlorine pools require regular treatments to maintain chlorine levels. This steady flow of chlorine keeps the water cleaner. On the downside, there’s an investment required to convert the pool. And because salt is corrosive, metal parts will have to be replaced more often. In some (but not many) cities and towns, saltwater pools are actually banned because the saltwater is harmful to nearby plants and soil. Check with local officials before converting.